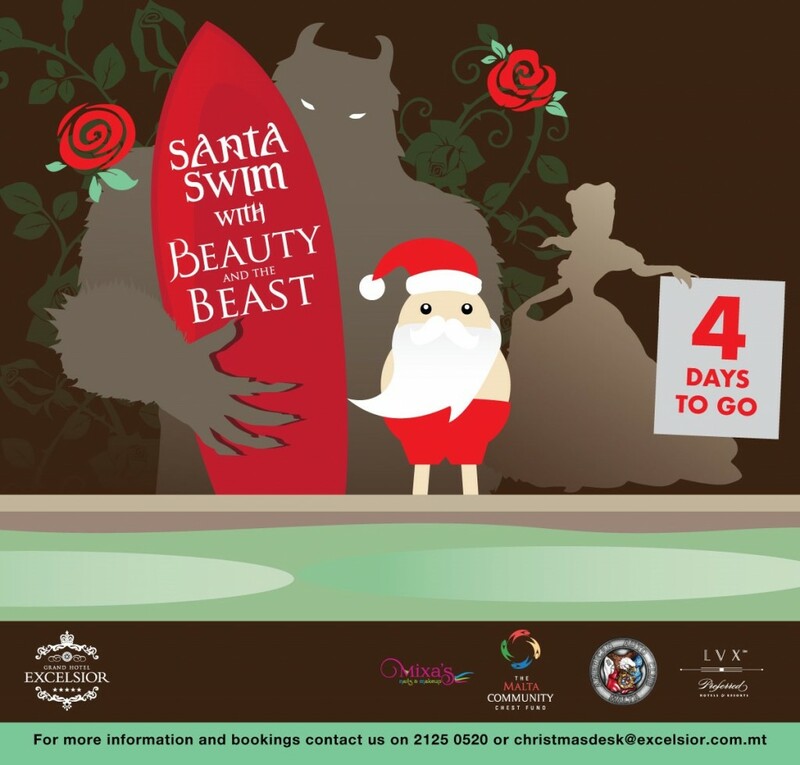 For the fifth year running, Grand Hotel Excelsior team members will be organising a Santa’s Swim. Colleagues, guests and members of the public are invited to swim in the clear, chilly waters of Marsamxett Harbour or make a splash in the hotel’s swimming pool. The event will take place on Saturday 3rd December 2016 and all donations will be in aid of the Malta Community Chest Fund. As a tradition, the hotel themes its Christmas activities, and the selected concept this year is Beauty and the Beast. On the occasion of this year’s Santa’s Swim, Beauty and the Beast characters will be joining as Santa’s special guests to do a brave dive for charity. Once again, present and former local Waterpolo players are being invited to participate in an exhibition match. At 9.45am the MCCF representatives will start collecting the donations and registering the participants. The band of the Malta Police Force will bring joy with live Christmas music and will be welcoming the participants at the Grand Hotel Excelsior lobby at 10am. This activity is being endorsed by the Malta Community Chest Fund and H.E President Marie Louise Coleiro Preca is expected to attend. 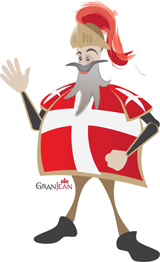 This entry was posted in 5 star hotel malta, About Malta, Christmas in Malta, Excelsior Hotel Malta, Excelsior Hotel Marina, Grand Harbour, Luxury Malta Hotel, Malta, Malta Events, Preferred Hotels and Resorts and tagged charity events malta, excelsior malta hotel, grand hotel excelsior malta, malta, santa swim on November 29, 2016 by Denise Camilleri. 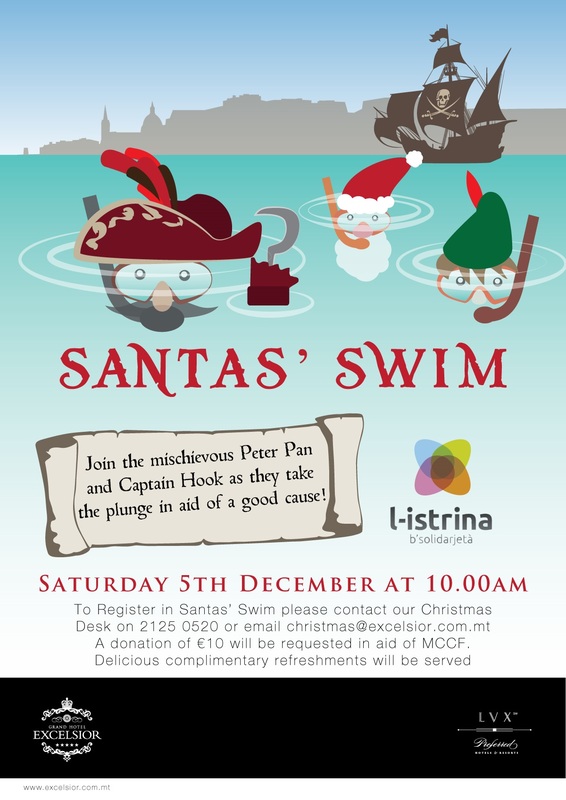 The Grand Hotel Excelsior Malta will be organising a Santa Swim on Saturday 5th December at 10.00hrs. The Malta Police Force band will bring joy with their live Christmas music. Proceedings in aid of l-Istrina. To register please contact our Christmas Desk on 21250520 or email christmas@excelsior.com.mt. This entry was posted in 5 star hotel malta, About Malta, Excelsior Hotel Malta, Holidays in Malta, Luxury Malta Hotel, Malta Events, Things to do in Malta and tagged charity events malta, christmas in malta, festive season malta, malta events, santa swim on November 19, 2015 by Denise Camilleri.